Painting is slow. It requires time, and attention, and engagement. Painting is without algorithm or artificial intelligence; rather, it is the most human of intelligence. It is the oldest intelligence, begat from the hands of ancient peoples, tens of thousands of years ago, on cave walls. There is something pure about paint on a surface, something primal that speaks to this origin of the first homo sapiens and Neanderthals painting with earth pigments and animal fat in hidden passages. It is this ancient quality, and its slowness, that attracts me to painting. The images I create are not a far cry from those ancient paintings. Their work was a response to the world they lived in; so is mine. Analog, the series, emerged out of a need to slow down, to simply work and be, like the ancient paintings. Contemporary life is fast, and electric, and I often feel as if I have been propelled down a highway at 70 miles an hour because I have. I am the mother of two young children, and I work as an artist, art educator and entrepreneur. This is the reality of my life, and it does not filter into my work so much as marinate me in it. After years of working intensely, I recently got to a breaking point—I couldn’t make art that was agonizingly hard anymore. I needed time to think about the painting, to love the creation of the work, and embrace it where it is. I needed to eschew content and subject matter and go back to the essentials of creating: to simply make colorful, soft, emotive abstract paintings that reflect the wonder I experience as a human being and in nature. This body of work comes out of considering the place of art and specifically, painting: to be analog, in a digital world. “Analog” in this sense refers to a return to older technology. Do not forget that there was a time when a paintbrush was technology. It holds the same power now; it simply requires a different kind of interaction with the viewer. It holds true in much the same way that a record requires more physical engagement: the listener cannot simply tell an AI to play a song, they must find the record, place it on the turntable, gently lay the needle on the record, and then, after one side has played, do it again for the other side. The act of listening is slower, requiring effort. Such is the act of looking at painting. You can look at a painting in passing, but you won’t get much from it. That’s why staring at artwork on Instagram can feel empty in a way that going to a museum, gallery or artist’s studio does not. For the latter, effort is required, making the experience more meaningful. My work is a reflection of all that I am, all that nature is, and all the wonder that exists in our universe. But, I boil it all down to an essence of mark and form and color, leaving only trace references to nature. Everything is abstract. That is the point. This concept is big and broad and transcendent (a word the art critic Jerry Saltz said specifically not to use when describing one’s work) but that is the authentic truth of my work. I’m tired of apologizing for it. Make of it all what you will, as they say. We live in an overwhelming, over-connected culture and react to it daily, hourly, in minute increments, constantly. Everything is curated for us, and demands our attention, and we have no time or place to just be. Our newsfeeds never reach the end, as there is no end to the scroll. This body of work has led me to question the conventional wisdom of the current trajectory of art. I am asking if all art that is made should or must be reflective of contemporary society. In other words, must art replicate the digital overload we already experience on a constant basis? Instead, because our world is connected and fast, could art possibly exist in contrast of that experience? What if art was a break from that speed and intensity of our everyday, over-connected lives? What if art gave you the same sense of peace as you feel after a yoga class or meditating or walking in the woods? What if art was a place to diffuse, rather than jar your senses? What if art embraced you as you are? What if art was softly feminine, unapologetically? These are the many questions I now ask as an artist existing today. This body of work comes from my own needs as a human. My work is contemporary, even if it uses slow technology, even if it is analog in a digital world. They harken back to a primal, rooted part of we human animals, a part that is still there, but buried by evolution and speed and technology. They transcend time and space, and center themselves in the human essence of existence: slow, deliberate, and real. Updates for Winter/Spring 2019 + Workshop dates! I am the artist-in-residence at the Children’s Museum of Denver through March 2019. 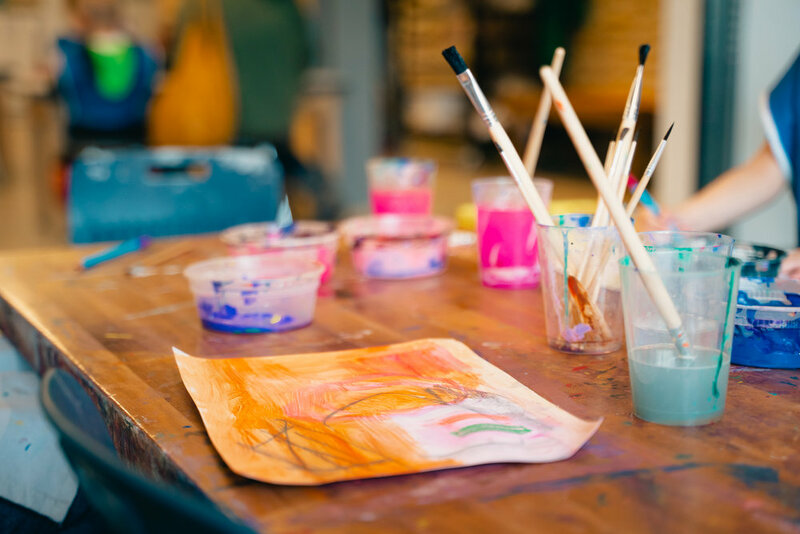 This is a great opportunity to make art with children visiting the museum (and their grownups). During my weekly open studio hours on Fridays and Saturdays, I share painting, drawing and mixed media techniques, and talk about the connection between color and emotion. At the end of the residency, I will also present a custom work that will become part of the Museum’s permanent collection. For details and dates, visit the Children’s Museum website. Tuesdays, 6:30 to 9:00 pm, February 5th through 26th. I’m battling my way through my work, preparing for an upcoming show, but also, as always, simply doing the work: creating, destroying, pondering, playing in the studio. Marking up canvases and instantly regretting the marks, or sometimes– not often– loving what I have made, and getting attached, wanting to keep it. Then destroying it and remaking it, again and again, until I feel like it is at a place balance and completion. The artistic process feels like a battle to me. It is one I am willing to fight, but nonetheless it remains a battle. Painting also often feels like chasing a wild animal, only the wild animal is my Self. I’m also doing a lot of inner work right now, rethinking my approach to language and my use of my voice as a person. Art has always been a means for me to have a voice, and to give all those emotions and experiences a place to exist and breathe. To feel real, and valid– in a sense, to give them solidity and form. To make the world a more human dwelling place. I can think of no better description of the purpose of art in this dark world. It puts into context the need for art, of all its forms and manifestations, whether dance or painting or song. We are making the world more human. And that is, indeed, a battle. This is not a world that wants more humanity. It is a world that wants and cultivates and craves more inhumanity, in all its forms, from robots making everything from hamburgers to cars, to the cruelty of separating a parent and a child as they cross a border, to the destruction of our very planet. I carry on this work, this mission, this battle. Whether in oil or acrylic, what is in these paintings is my soul, my humanity– and I am not being overly dramatic. We are here to say something, artists. Say it. A personal essay exploring the intersection of art, science and the transcendent experience. 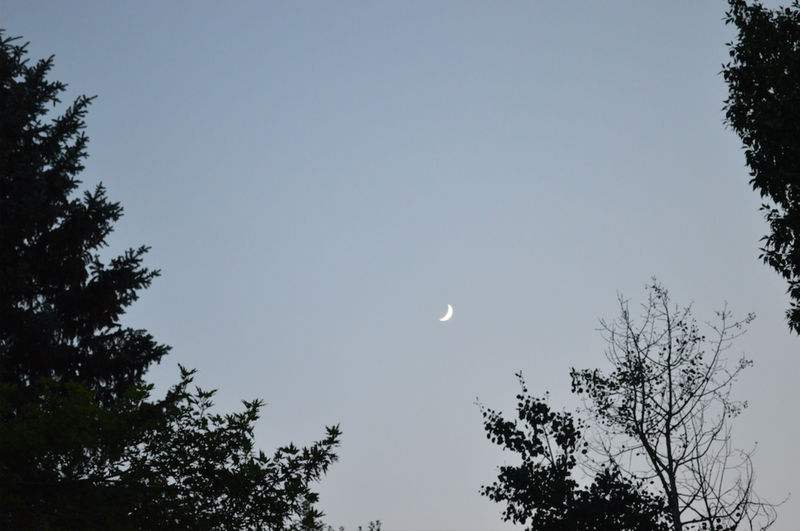 When I look at the sky, I feel as if I live in it. It is a subsuming force, one I observe constantly throughout the day. I am caught in the interactions of cloud and color and light: all glistening and silver; or dark, inky blue; or soft and gray; or infused with pink and gold; or with silhouetted trees and mountains. Nature is a place of transcendence for me, even in small moments or in passing. I spent my childhood immersed in nature. I grew up playing in the plains and mountains of Colorado, encountering big mountains and big skies. I skied, hiked, wandered, camped. My parents were wannabe ski bums, mountain people. As an adult, I chase that feeling from my childhood, of being one with nature – and being of it, intertwined, connected. Abstract painting is how I respond to nature, and my experience within it. With color, mark, and form, I bear witness to my place in the natural world, and honor its mystery. At the tail end of graduate school in New York, I wandered into a bookstore and found A Sense of the Mysterious, by theoretical physicist and writer Alan Lightman. I took this book home to my lonely apartment in Park Slope in Brooklyn, and promptly devoured it, finding in it a familiar language for my experience as an artist and nature-lover. Lightman’s writing illuminates the profound relationship between humans and the natural world. He captures our human wonder and awe at the phenomena and structure of nature, which we discover through scientific inquiry and research. The scientific method and resulting theories are not so much immutable facts as they are a means by which we understand our physical environment and the patterns and messages it holds– much in the way that art is a means to express and understand life and that same natural phenomena. Lightman asks us to notice the magic of scientific discoveries, pondering their meaning and implication for our society as well as our selves. And he asks that we remain fully human, awake to the mystery of this planet we live on, and the workings of our universe. Science is not about expression, though. For us to explore the emotional, transcendent experience of nature—and perhaps we can be brave and call it the spiritual experience– we need something else. It was Lightman that helped me find the thread that connects art and science. He unites these seemingly disparate modes of thought, offering them as a continuum, each a method for interpretation and discovery, both personally and universally. Lightman connects the emotional resonance of the physical world with the concrete ideas behind it. Essentially, a scientist works to name things—to quantify them, pin them down—in order to understand the thing as a mechanism or a function. On the other hand, artists are not working to pin any thing down, but rather to unveil the meaning of the thing. With the artist’s touch, the thing envelops into metaphor, an experience, a feeling. It moves beyond its name. But, we can be both scientist and artist. We can exist with names, and beyond them. We can understand our world, and transcend it. Art is about experience, and science is about definition. The two appear to contrast—one nebulous, the other concrete—but at their core, they are exploratory. The act of discovery can be accomplished through painting or in the laboratory, through dance or through math. Recent studies of Neanderthals suggest that they were, in fact, artists—and much smarter than we originally thought. This realization also says to me that art is not necessarily the purview of the intellectual, but rather is a primal imperative, rooted in us as creatures. We make marks and draw the shapes of what we see not just to describe what we have seen, but also to say how we feel about what we have seen. In essence, we create to make ourselves seen. I paint abstractly because no literal representation could capture what I feel. My work goes beyond naming, and the use of images and words. Instead I develop my own language, fundamental in its use of mark and form, as a personal, emotional alphabet. I go beyond the constructs of what is seen in the natural world, and delve into what I feel. The thing I am trying to quantify and explore in my work is the transcendent experience. That feeling in which I am very small, and the world is very big; in which beauty and power are all-encompassing. The sky, a mountain, the tree as it changes color with the season. Nature is a place of transcendence. Nature brings us in connection with the divine, the sublime, with ourselves, with our mortality, with eternity. We ask questions of it, and it asks questions of us. Nature reflects our humanity back to us, as we project our humanity onto it. In his book Searching for Stars on an Island in Maine, Lightman dives into the contradictory spaces of science and spirituality, seeking to reconcile their conflicts. He ponders the two, drawing Venn diagrams of scientific and spiritual thought. Nature is where he finds the connection. In my view, spirituality has long been the purview of the artist, who, working as shaman or mystic, unveils the magic of the physical world – in other words, elucidating the concept of transcendence. We, as humans, have a need to understand our world and our universe. And to fulfill this need, we require multiple modes of discovery and exploration: science, art and spirituality. Science elucidates the functioning of our physical world; art and spirituality unveil its meaning. The transcendent experience is a singular data point, but it does not need a proof. The experience is the proof. This is one of the reasons that I am an artist. I need to create and discover, in my own way, my relationship to nature – to explore the meaning of nature, and who I am in response to it. I am no scientist, nor have I ever been one. But I am, no less, on a path of discovery, of exploration, as different as it may look from a scientist’s passage through their research. My lab is a studio; my instruments are color and brush and pigment and fabric and paper. I take these tools and make of them something else entirely, moving beyond naming, crafting a vision, a manifestation, of this lived human experience in a world shaped by time and tumult – and I do so to leave a mark like the ancients in their caves that came before me. Alan Lightman, A Sense of the Mysterious. New York: Pantheon Books. 2005. Alan Lightman, Searching for Stars on an Island in Maine. New York: Pantheon Books. 2018. Emma Marris, “Neanderthal artists made oldest-known cave paintings,” Nature, https://www.nature.com/articles/d41586-018-02357-8, February 22, 2018. Earlier this year, I was commissioned by a client in California to create a large oil painting. It was a piece in reference to one I had completed earlier that year. Here is the process from start to finish. If you are interested in commissioning a custom work from me, please contact me here and give me some details on your project. Starting out with base layers of color in oil. Before the start of a project, I ask the client a series of questions about their project. Specifically, I ask for color palettes and compositions they would like to see, plus size of the work. 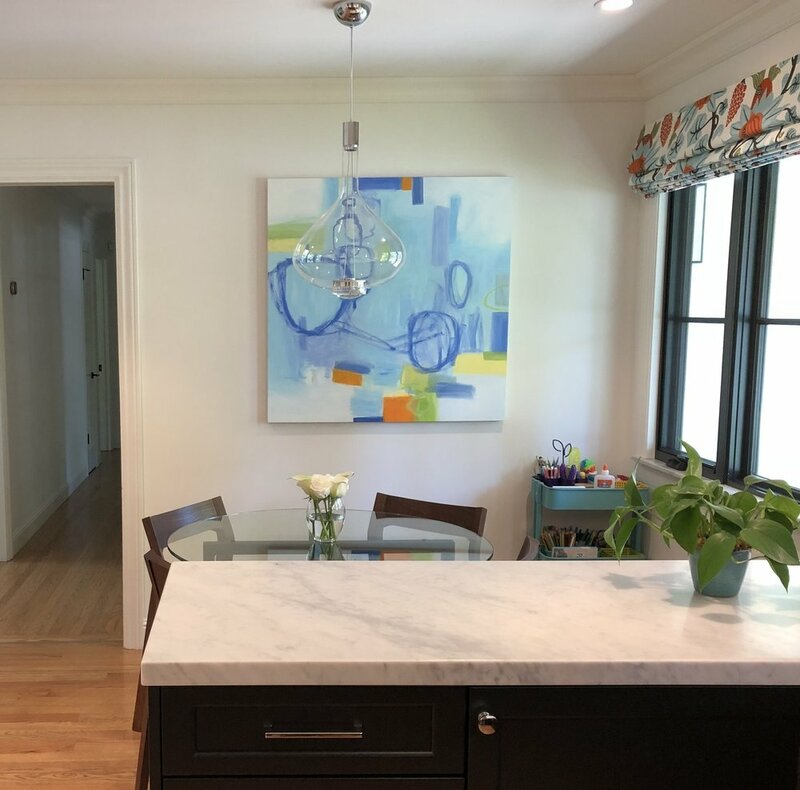 This client wanted a piece with lots of light blues, pale teals, and greens, with accents of yellow and orange. This project was based off of a previous painting I had done that they enjoyed, so I had a good jumping off point. I cannot create the same thing twice, but can work "in the style" of an older work. The completed work, after many layers! I named it "Finding the Flow." This work is oil on canvas, 40" x 40. This piece took about 4 weeks to complete, with another 2 weeks needed for the oil paint to dry completely. Project completion varies by size and materials used. Installed in the client's home. 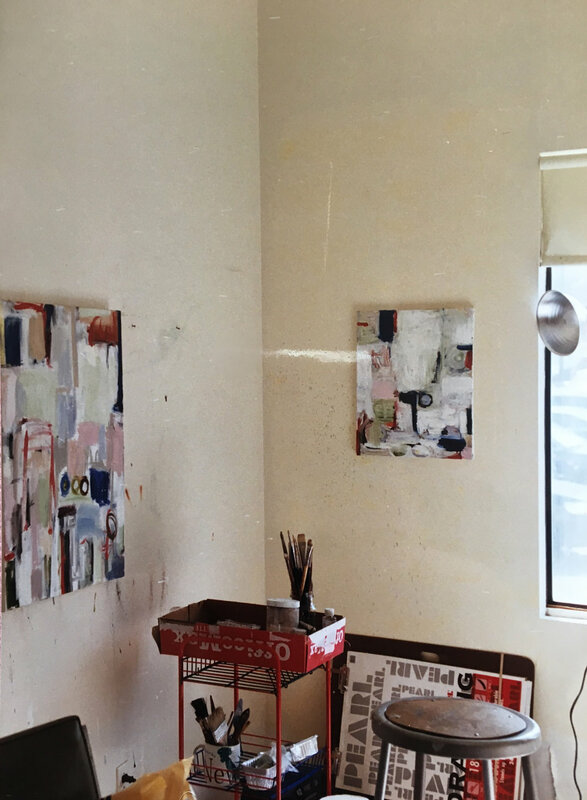 My studio at Pratt Institute, 2002. It was my grandfather who told me to pick something as a career that could be done for the rest of my life. I felt instantly smart in my choice of becoming an artist, even if at times I still question it. It is, if nothing else, something I can do for the rest of my life. I joke often that “life is short, art is long.” Art is history- not dead, but really ishistory. It lasts; it is forever, good and bad. Worse than a terrible comment on Facebook, art doesn’t really ever go away. You make something, you make more, you go back to that first thing and wonder what you were thinking. And so on, for decades. I am thinking about legacy, and also about the act of creating. The long slog that is being an artist- the daily struggles, the agony of failure and the joy of success, in all their forms. I wonder if my work will end up in thrift stores when collectors grow tired of it, or if they will love it enough to pass it on to their children. In the grand arc that is an artist’s career- their oevre- what is their message? What am I saying in painting after painting after painting? A year or so ago, I sat crying over a painting I thought I had ruined. My daughter and husband came downstairs to the studio to check on me. I looked at my daughter and said, “Painting is just really hard, honey.” I looked at my husband and said, “I could quit, but you’d have to heavily medicate me to get me to stop thinking about painting.” In that moment, like so many moments before, I knew I was stuck with this choice I had made in my life, this artist life. There was no going back. But it is something that I can do forever. When opening a show of my work at Jennifer Perlmutter Gallery in Lafayette, California in February, I met one of my fellow exhibiting artists, Michael Rizza, a 90-year-old sculptor. At the artist talk, he said that his granddaughter had asked if he was famous, to which he had replied, “I’m not famous- I am undiscovered!” We all laughed, recognizing that fear all artists have of obscurity. (“Help, help! I’ve fallen into obscurity and I can’t get up!” joked a recent New Yorker cartoon.) Yet many of us keep creating, out of that primal need that art-making is, going back in history to the very caves of our ancestors themselves. Julia Rymer is an abstract painter and writer based in Colorado, where she creates work inspired by nature, science, and color theory. Learn more at juliarymer.com. What is pink? Pink is a movement. Pink is gender identity. Pink is femininity. Pink is therefore off limits to some people. Pink is embraced, reviled, and worshipped. One thing it is not is ignored. Pink is a color phenomenon at this juncture in American culture. Everyone has an opinion on pink, and a personal interpretation. In 2000, I created 21 pink paintings as part of my BFA Thesis at the University of Denver. Why pink? I wasn't sure- I just loved this pale pink color I could create with titanium white and alizarin crimson oil paint. I went wild with brush strokes and texture, and was told that I had "made pink look tough" by one of my professors. Which, I thought, was a rather odd comment. I had never thought of pink as weak, but there it is. Why do people scoff or worse, recoil, when a little boy is dressed in pink? Why does every little girl I meet tell me her favorite color is pink? Why do I have so many conversations with fellow artists, collectors, gallerists and curators about the color pink? I love pink. Light pink, dark pink, fuschia, magenta, rose, salmon, opera, quinacridone- give me one of each. Let me fill a painting with pink. I add the color, in some form, to nearly every painting I make. If you look closely, it is there. Pink is love. Pink is passion. Pink is beauty, softness, grace, power. Pink is here to stay. I've got a BIG announcement! After almost 8 years living in Northern California, my family and I will be returning to Colorado next month! Leaving California is bittersweet, as we have made wonderful friends here, and I was able to devote my time to my art and art business, as well as start a family. But Colorado is home for me, and I am thrilled to return to my family, friends, the mountains and the art community we love. We have found a home in Littleton, which is about 20 minutes from Downtown Denver. I will have a dedicated studio space at our new home, and will get it set up as soon as possible. My plan is to continue building my body of work, creating larger scale paintings on canvas and paper. If you are in the Denver area and would like to arrange a studio visit, let me know and I will contact you once I am settled in. My relationships with Jennifer Perlmutter Gallery in Lafayette, CA and Serena & Lily are continuing. My work will be included in the December show at Jennifer Perlmutter Gallery. Also, I will be back in March 2017 for an exhibition at Danville's Village Theater Art Gallery called "Color Play." The show will feature work by many talented abstract artists, including Elise Morris, Ellen Levine Dodd, Karen Olsen-Dunn and Sharon Pastor. I will keep you all posted as we get closer! Lastly, thank you to all of my California supporters and art collectors. This journey has been amazing. Please keep in touch with me! Every painting is a journey. One of the most common questions I am asked as an artist is how long it takes to complete a painting. This question does not surprise me. The process of making art is foreign to many. And abstract art, despite existing in the cultural lexicon since at least the late 19th century, remains mysterious in its meaning or worth, leading to the dreaded declaration, "My kid could do that." It's true. Kids make great art. But, I'm going to show you how I make art. I don't know how a work starts. Something strikes me- a word, a color, an image from nature, a shape I feel like making, a composition that has been flashing behind my eyes as I drift to sleep- that incites a need to create. I head to the studio. I prep the canvas or paper, lay it out on table or easel. I mix up my color, dip my brush, and I start. Immediately I react to what I just did, adding new color, a charcoal or graphite mark, or a shape, repeating the process until I built up to a composition that feels like it has balance. The process can take minutes, hours, days, weeks, years. I never really know. Sometimes I sit with a piece for months, photograph it, market it, and then a few months later, paint over it. This is a painting I began months ago. I painted it at the same time as two other pieces, and had some extra paint to use up from those paintings, so I quickly did began this one. Then it sat in my studio until two days ago, when I finally decided that it wasn't finished. I initially liked how fresh it felt, and the lightness of the marks. I love simple paintings. But this one didn't last as a design. It needed more. Here is the story of where it went from there. At first, I added some drawn charcoal lines and shapes, and started painting in more colors: turquoise, green, navy blue, gray. I turned the piece upside down to take a look at how the design drew the eye through it, and how "balanced" it seemed (did the parts on one section relate to parts on another section). Did the parts relate to the whole? Did some stick out, or become distracting? I decided to keep going. I actually forgot to photograph the step in between these two steps, but no matter: it was terrible. WAY too much pink. I had nicknamed the painting "Miami." Yikes. Here's where I went from there, subduing the warm colors, and building up the surface more. More blues, more grays, more greens, more layers. I turned the piece around again, and covered up quite a bit of the underpainting with cool colors. Shapes begin to connect through the middle, creating relationships in the composition, moving the eye around the piece like guideposts or bridges, from one section to the next. Pictured here at the Denver Art Museum, in front of Joan Mitchell's painting, from left, some amazing women artists: Bonnie Ferrill Roman, Danielle Hicks, Julia Rymer (and baby Liam), Tonia Bonnell, Mindy Bray, Veronica Herrera, and Anna Kaye. I just returned from a lovely trip to Denver, CO, visiting family and friends, and checking out galleries and museums. Many were exhibiting women artists in celebration of the Denver Art Museum's Women of Abstract Expressionism show. A large group of my friends and I met up to see the DAM show and revel in the magnificent work (pictured above). Some of the most influential artists of my work were on display, including the inimitable Joan Mitchell. At the Center for Visual Arts, "Colorado Women of Abstraction" featured good friends and artists Amy Metier, Tonia Bonnell and Skyler McGee. It was lovely to see the work of so many strong women artists on view. It is wonderful to see the women of abstract art recognized for their work, from the trailblazers to those working today. Art warms a home or office space. It engages people, draws them in, as an element of comfort or of interest. It energizes an otherwise drab space, provides a sense of peace, or provokes conversation. Original art is not boring, and art collecting is not something only the 1% can participate in. Jennifer Perlmutter Gallery May Exhibition. www.jenniferperlmuttergallery.com for more info. In a world where the latest smart phone or device is obsolete within a few months, art has staying power. It lasts, possibly generations. It creates a tradition. Art collecting is for everyone. Whether a big painting, a dynamic photograph, or a small print, art gives light and enjoyment to one's life. This month, Jennifer Perlmutter Gallery is featuring work at all price points for the emerging collector to start their art collecting journey. Please take a look! You won't regret it (or the art you'll buy). I have a large number of pieces available: big and small, framed, works on paper, prints, paintings, and works on canvas. Stop by! The artist reception is on May 12th from 7 to 9 pm. Covalent, mixed media on paper, 12" x 12" framed. On April 23rd at Jennifer Perlmutter Gallery in Lafayette, CA, I spoke about the influences of science and nature on my work, as well as details on my art process. If you missed it, here is a recording of the talk. I recently had lunch with a good friend and fellow creative, the writer Cheryl Dumesnil. We talked about the particular struggle of pregnancy, birth, the day-to-day care of a child, and finding within that very full world a place to write, or paint, or sculpt, or dance. My takeaway from the conversation was that "going with the flow" takes on new meaning when you are an artist and a mom. Creating again did not come easy in the beginning of my parenting journey- or even for years after my daughter was born. It was a near daily struggle. After days, weeks, months of not painting, I would start a painting or even a series of work, lose momentum easily, beat myself up, and then try to get back to the studio, again and again and again. I spent too much time on the losing momentum part and the beating myself up part, and it was only when my daughter was about 4 years old that I developed a strategy for creating and balancing parenting. That I had trouble figuring all this out is no surprise to me: I had only one role model. At the start of my art career, and until I was a mother myself, I personally knew of one- yes, one- working female artist that had had children. All other women artists in my orbit either preferred to focus on their art and build their careers, or had given art up completely. There was no room for both in their minds, hearts and lives. Unlike the many male artists I knew, almost all of whom had children (and wives at home to raise them), the women artists I knew at the start of my career felt that the creative life precluded motherhood- that it would be undone by motherhood, subsumed under its weight- and some simply let that happen. As I have gotten older, I have met and connected with numerous women artists with children, to the point where they are no longer unicorns. Though all struggle with balancing their responsibilities to their children and their art, they all have somehow made it work. Most took time off after having their kids, but all eventually got back into the studio. This is heartening: Your artistic life is not over just because you choose to have children! But balance between art and motherhood is not the goal. There are times when family and home responsibilities take over, and art gets put on the back-burner for a time. There are times when you can focus on creating, without distractions. There are times when you will struggle to do both, if only for sanity's sake. Now I have a newborn son, in addition to my daughter. Art-making has become even harder. I have been slowly, over the past two months, easing myself back into the studio. It became a necessity after a certain point so that I can feel like myself again, and use my brain for something besides diaper changing and feeding. Some days are good. Some days are horrible. I muddle through, finding space for my work along the way. I've been on a bit of a break since having my second child. I'm starting to get back into the studio and will be releasing work onto the website soon. Sign up for my Fresh Paint newsletter to be the first to know! Is color the same everywhere for everyone? How have artists attempted to control color? These questions are just a few of those posed by a rich and varied exhibition at the Victoria Myrhen Gallery at the University of Denver’s School of Art & Art History, opening next week, January 14th. Contemporary artists from throughout the United States as well asmodern masters like Josef Albers and Helen Frankenthaler will have work on display that explores the complexity and nuance of color in art. This show is co-curated by Jeffrey Keith, a renowned visual artist, color theory expert and University of Denver professor (and my former mentor), and Dan Jacobs, the Director of the Victoria Myrhen Gallery. For those of you in the Denver area, or with plans to travel there soon, this show is a must-see! For more information, go to http://vicki-myhren-gallery.du.edu/. I love color challenges. This was not my first from him- I had studied with him for many years by that time, and was fresh out of graduate school, stuck in the series of paintings I was working on, and needing something new. His challenge propelled me into another series, one very different from the work I had completed for my master’s thesis. Years later I learned to pose color challenges for myself on a regular basis. I usually do this by limiting the palette I am working with, or trying to create a “mood” through my color choices in my work. The past year has been an exploration of feminine and masculine color schemes. As an artist I bristle at being called a “female artist”— why is there an indicator of gender needed; no one calls an artist a “male artist” — yet we live in a culture that places meaning on color. I call these Color Identifiers, also known as Color Analogues. Color can identify as masculine, feminine, or it can be both, depending on the contextual colors around it. This dichotomy compelled me in the studio, and my work evolved largely because of it. Interestingly, I am not the only one exploring the color juxtaposition of “male” and “female” colors. Pantone chose two colors for the Color of the Year in 2016, a pale rose pink and lavender blue, to express our culture’s current obsession with gender identity and dynamics. What also interests me about this process is the relationship I have with "feminine" colors as light, pale, pastel, warm, beautiful or pretty, and "masculine" colors as harsh, dark, muted, cool and unattractive. Where does that subconsciously come from? Let me know what you think of my work- does it seem “feminine” or “masculine” to you? Does it bridge that gap as I intended? What are your “color identifiers”? But then, after a reboot with supplies and direction, I got it together, and created a strong series of work inspired by the colors and memories of New Mexico. The project was a great exercise in restraint, and it pushed me out of my comfort zone. I had so much fun, I thought, why not do an entire series of paintings exploring my memories of the natural world? And that’s what I am working on right now, along with furthering the Entanglements series. All before my second child is due in one month! Gotta keep it interesting, right? One of the most profound moments of my artistic career happened not with a great mentor or inspiring artist. It happened, instead, with a professor I quite detested at the time for their negativity, cynicism, and angst. I never took another class from her, in fact. But their advice to me in that moment was one that has stuck with me to this day, and I still think of it often. In my first semester of graduate school, I struggled to find my voice as an artist, flitting from style to style and media to media like a toddler exploring a room filled with new toys. I did not stay with any one thing for long. My lack of focus was frustrating, for how do you get a grasp on creating an entire master’s thesis when you cannot commit in the span of one artwork? You will just have to make the art you make, and you are going to have to be OK with that. Both revelatory and a shock, this was a lesson that has slowly sunk in over the years. What this professor meant was: be the artist you are. Don’t be someone else­– not your famous professor, best friend from art school, or that guy who randomly picked up a paintbrush one day and now sells paintings for $20,000 a pop. Not the Pop artist, or the friends whose art involves tagging the neighborhood. Don’t make someone else’s work; make yours, and be OK with that. It has taken me decades of work as a painter and printmaker to hold my focus, creating abstract paintings and prints that explore my fascination with science and nature. Only once I stopped flitting about in the studio, and buckled down to a series that could sustain me for years, did I start to feel my confidence as an artist grow. These years of dedication were affirmed recently, when I met with a gallery director, who said to me, “You just keep your style, your palette, your vocabulary.” She said that if I don’t, my work is not authentic. And authenticity is something I value as much as beauty and craft. So, be brave, artists. Just keeping making YOUR art. The past year has been one of serious ups and downs, personally and professionally. The life of an artist is never easy, as people LOVE to tell me, but there are times when one needs guidance. As I searched for artists I could connect with online and in real life, I discovered a workshop for creative professionals called Gather. It seemed like such a special program that I signed up for it as soon as possible, and my husband and I planned an entire vacation around a trip to Atlanta and the Southeast for the workshop. Gather is an intensive two-day experience that aims to inspire, educate and connect creative professionals of all levels and backgrounds. It is the brainchild of branding and design master Mattie Tiegreen of Green Tie Studio and photographer Kaitie Bryant in Atlanta. But it is so much more than branding, design, social media management and business practices. It is connection with other creators, people working with their hands and minds to create lovely images and objects. It is learning about how to transform your passion into a business- and how to set boundaries and manage it so you still have a life. It is encouragement to keep trying new things, exploring new ideas, and taking risks to become a better artist. When I arrived in Atlanta for the workshop, I had been feeling pretty down about myself as an artist. I wasn't sure that what I was doing was the right "type" of art for success (whatever that means). As one of only a few working artists I know in California, I was feeling isolated and alone. 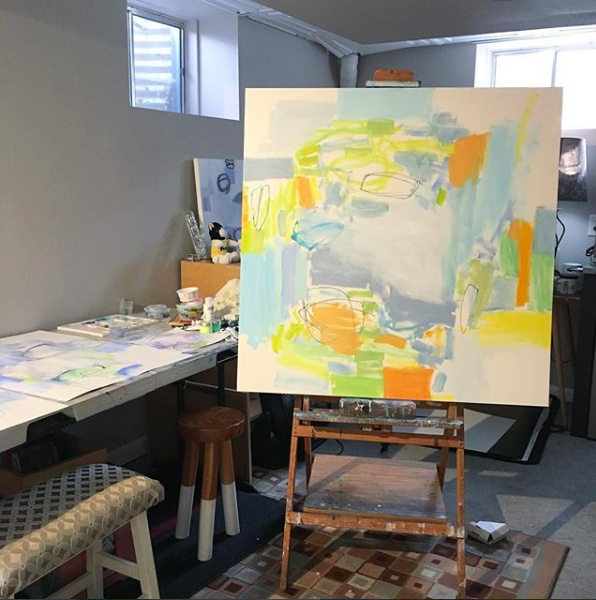 When I left the workshop, I had new friends and connections; I had gained wisdom to help build my art business; and I had renewed inspiration to keep making abstract paintings and sending them out into the world. On top of all that, I just had a lot of fun. And Atlanta is a wonderful city to visit. We loved visiting the High Museum of Art and the Aquarium, and spending time at Gregg Irby Gallery as well! There is amazing food there too- we had our welcome dinner at Sun in My Belly. It was YUM. After Gather ended, we (meaning my husband, four year old daughter, and father) road tripped to South Carolina for a week at the beach. We rented a place on Seabrook Island, and swam and ate ourselves silly, with a couple of days for sight-seeing in Charleston as well. Charleston is fantastic. It is filled with history, beauty, and if you look in the right neighborhood, killer contemporary art. We visited the oldest Reform Jewish synagogue in North America, Kahal Kadosh Beth Elohim, wandered around the gallery district, and ventured to midtown to see Redux Contemporary Art Space and Studios, The George Gallery, and Mitchell Hill Gallery and Interior Design. The food at Lowcountry Bistro and Virginia's was excellent as well. I really enjoyed visiting the Southeastern United States. I hope I get to return soon. It was a trip that renewed me and inspired me as an artist, and fed me, body and soul. For the past several months, I have been hard at work on a series of paintings I call the "Entanglements." These paintings on paper and canvas were inspired by my discovery of quantum entanglement theory, which posits that when any two particles come into relationship with one another, they become irrevocably “entangled.” Even after they separate, when one particle is observed, it begins spinning clockwise, while the other begins spinning counter clockwise at the same time, no matter how many light years apart they may be. This scientific theory is- for me- a metaphor for human connection and interaction over space and time. It is the idea that we- humans, flora, fauna- are interconnected no matter our distance from one another. I have put this ongoing series of paintings together into book form, which I invite you to download, enjoy and share. The link to download it is here. It is free for now- I just want to get it out into the world.